Direction: Using 101E Acne Getaways is easy and hassle free. It is used twice a day, at morning and before going to bed. Just rinse the face with our herbal skin wash, pat dry the skin ,Apply 101E Gel directly onto targeted areas 2 times a day to treat the acnes.Massage the skin for few minutes. 101E Acne Getaway is a clinically tested herbal acne remedy that not only cures acne but also makes your skin healthy. 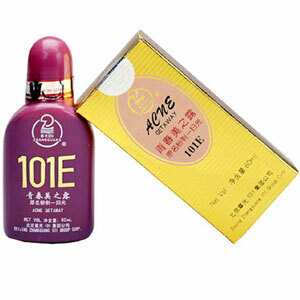 Acne Getaway 101 E is an exceptional blend of 10 medicinal plants having matchless skin healing powers. These plants combined in 101E Acne Getaway hydrolyze and clean up your skin pores and do not allow bacteria, dead skin cells and skin oil to entrap inside skin, providing foundation for acne development. It is effective, safest and easy to use acne remedy that shows visible results within a week. 101E Acne Getaway contains extractions of more than 10 herbs proved to be effective against acne and other skin ailments. It is formulated using advanced technology to keep herbal properties intact. It covers all aspects of acne breakouts and skin care. It destroys bacterial colony within hair follicles, strengthens the immune system and normalises hormone levels. It is formulated for all genders (male and females) and teens and adults. Anyone can use it as it does not cause any side effect. It cures scars, blemishes and pigmentation marks from previous spots.